"In the summer, use fresh sweet corn off the cob. 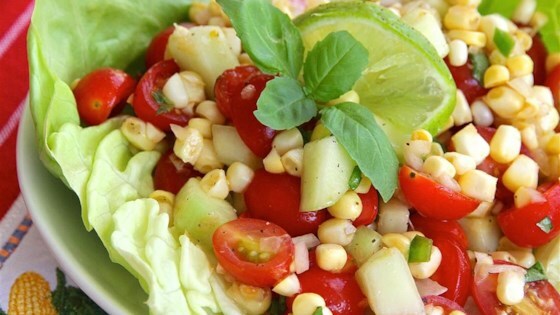 Saute the corn for five minutes in a skillet before adding it to the salad." Combine basil, olive oil, lime juice, sugar, salt, and pepper in a jar and screw on the lid; shake until dressing is completely blended. Stir corn, tomatoes, cucumber, jalapeno, and shallots together in a bowl. Drizzle dressing over corn mixture and toss to coat. Refrigerate until serving. The freshest tasting tomato appetizer you'll ever make. Made this tonight and was delighted. I used fresh corn and added a little more of the dressing, very light and refreshing. This is a great tasting and easy to make salad. I was surprised at how good it taste.